Dried, lean, teriyaki beef jerky. The delicious, high protein snack. 97 calories. Gluten free.High protein, low carb diets are very popular. They work! 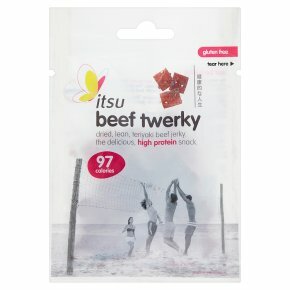 itsu's new beef twerky is the perfect snack, gluten free and high protein (over 11g per bag). This dried, lean, teriyaki beef snack is made from premium silverside beef, marinated and gently smoked over applewood. Warning: This pack contains an oxygen absorber packet to enhance freshness. Do not eat.